In a blatant plug for the Reagent Guide, each Friday I profile a different reagent that is commonly encountered in Org 1/ Org 2. Version 1.2 just got released, with a host of corrections and a new page index. What it’s used for: PCC is a milder version of chromic acid. Essentially, what it does is oxidize alcohols one rung up the oxidation ladder, from primary alcohols to aldehydes and from secondary alcohols to ketones. Unlike chromic acid, PCC will not oxidize aldehydes to carboxylic acids. Similar to or the same as: CrO3 and pyridine (the Collins reagent) will also oxidize primary alcohols to aldehydes. Here are two examples of PCC in action. 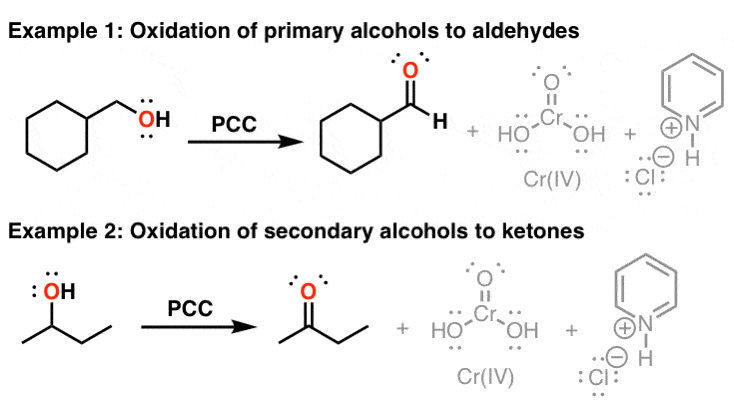 If you add one equivalent of PCC to either of these alcohols, you obtain the oxidized version. The byproducts (featured in grey) are Cr(IV) as well as pyridinium hydrochloride. One has to be careful with the amount of water present in the reaction. If water is present, it can ad to the aldehyde to make the hydrate, which could be further oxidized by a second equivalent of PCC were it present. This is not a concern with ketones, since there is no H directly bonded to C.
How does it work? Oxidation reactions of this sort are actually a kind of elimination reaction. We’re going from a carbon-oxygen single bond to a carbon-oxygen double bond. The elimination reaction can occur because we’re putting a good leaving group on the oxygen, namely the chromium, which will be displaced when the neighboring C-H bond is broken with a base. The first step is attack of oxygen on the chromium to form the Cr-O bond. Secondly, a proton on the (now positive) OH is transferred to one of the oxygens of the chromium, possibly through the intermediacy of the pyridinium salt. A chloride ion is then displaced, in a reaction reminiscent of a 1,2 elimination reaction, to form what is known as a chromate ester. The C-O double bond is formed when a base removes the proton on the carbon adjacent to the oxygen. [aside: I’ve drawn the base as Cl(-) although there are certainly other species which could also act as bases here (such as an alcohol). It is also possible for pyridine to be used as the base here, although only very low concentrations of the deprotonated form will be present under these acidic conditions.] The electrons from the C-H bond move to form the C-O bond, and in the process break the O-Cr bond, and Cr(VI) becomes Cr(IV) in the process (drawn here as O=Cr(OH)2 ). Real life notes: If you end up using PCC in the lab, don’t forget to add molecular sieves or Celite or some other solid to the bottom of the flask, because otherwise you get a nasty brown tar that is a real major pain to clean up. The toxicity and mess associated with chromium (as popularized by this lady) has spurred the development of other alternatives like TPAP, IBX, DMP, and a host of other neat reagents you generally don’t learn about until grad school. P.S. You can read about the chemistry of PCC and more than 80 other reagents in undergraduate organic chemistry in the “Organic Chemistry Reagent Guide”, available here as a downloadable PDF. The Organic Chemistry Reagent Guide is here! You’re website has been very helpful for preparing for my ochem final. Learning the concepts through your articles has bettered my understanding of the material. Thank you so much, this website condenses my entire quarter in a few pages! trying to get some images of PCC (pyridinium chlorochromate) in aqueous solution from ≈ 100 mM to 2 mM. Are they all brightly colored at these concentrations? Aqueous solution? Yes, absolutely it will be strongly coloured. Why is PCC a ‘weak’ oxidizing agent? It’s my own term and is admittedly not the most rigorous one. I use that because it oxidizes primary alcohols to aldehydes and stops there, in contrast to what I call, “strong” oxidants (like chromic acid) which oxidize primary alcohols to carboxylic acids. Hey, James. Does PCC react with tertiary alcohols? No, tertiary alcohols do not oxidize. This is very helpful. I have been looking for chemicals to oxidze primary alcohol to aldehydes only. It seems PCC may be a good choice. My question is that if I used carbohydrate, such as glucose, does it oxidize all other non-primary alcohol? Yes, you’d be wise to employ a glucose where the secondary alcohols have protecting groups. PCC is not selective enough for primary alcohols. It would oxidize everything. You’d need to protect the hydroxyl groups you don’t want oxidized. Hello! Can KMnO4 also oxidize ketones? To what? If you want to oxidize ketones to esters, I’d suggest using a peroxyacid like m-CPBA which will give you esters via the Baeyer-Villiger oxidation. gosh, I wish I HAD this resource when it was my time to learn ochem at high school… nice! Hi! Your website has been so, so helpful to me over the years during my chemistry undergraduate degree. Just wondering – I’ve seen PCC can oxidize activated C-H bonds in dihydrofurans to the corresponding lactone (http://reag.paperplane.io/00002426.htm#2). Do you know if any of the listed alternatives (DMP, TPAP etc) are also able to do this reaction? This would be a variant of allylic oxidation. IBX (and to some extent, DMP) should be able to do this, but I haven’t seen TPAP do it. Sir I want to know one thing.i am having organic course in my college and my sir told that CH2Cl2 is used as solvent in PCC as it is non polar.However if DMF(dimethyl formamide) is used it gives directly carboxylic acid.i couldn’t find any explanation to that.Do you agree? The only way a carboxylic acid would form is if the DMF is wet. Added water will make a hydrate that will oxidize to the carboxylic acid. Does one not necessarily need dichloromethane with PCC to convert a primary alcohol into an aldehyde? Useful mechanism! 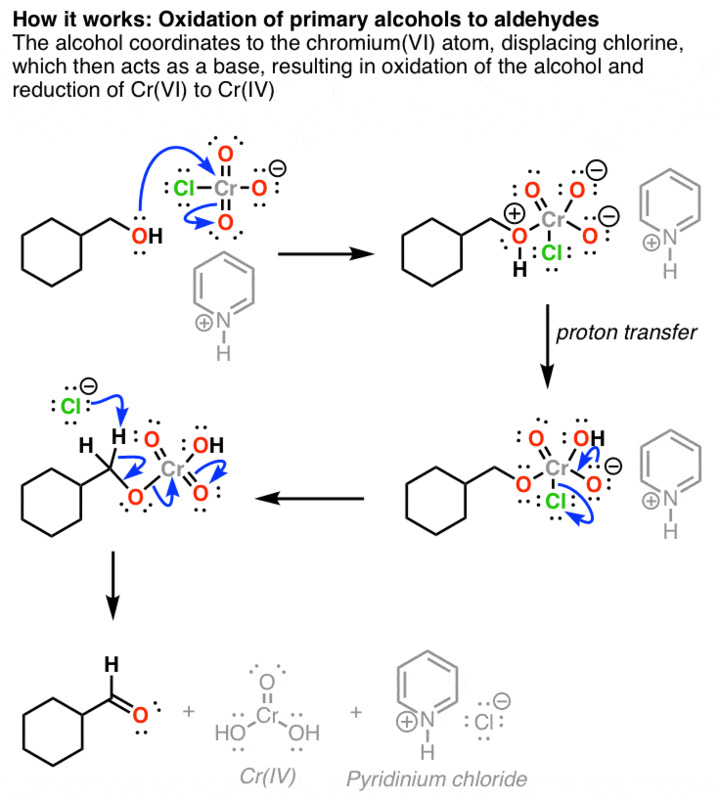 Question is how did an alcohol form on the PCC on the 3rd step with the Cl leaving? I’ve drawn a Cr=O bond forming at the same time as Cl- leaving. Take it with a grain of salt.